(CelebrityAccess MediaWire) — Global Spectrum is partnering with Pico, a global event marketing company listed on the Hong Kong Stock Exchange, to expand its business operations into Asia. The first management project for the partnership is the new, 450,000-sq. ft. Chongqing International Convention and Exhibition Centre (CQCEC), the newest and most sophisticated large-scale facility of its kind in Western China. "The Chongqing International Convention and Exhibition Centre is a magnificent facility and we're looking forward to bringing our expertise and resources to Chongqing," said Global Spectrum President Michel Sauers. Located in one of Chongqing's core business districts, the new CQCEC features 450,000-sq. ft. of exhibit space, including the largest single pillar-less exhibition hall in China (150,000-sq. ft); 130,000-sq. ft. of outdoor exhibition space, the largest ballroom in Chongqing with seating for 1,100, and the most modern 1,100-seat Lecture Theater with six-language Simultaneous Translation (SI) Capability. Global Spectrum will provide technical support to Pico on the CQCEC. "Global Spectrum has an incredible reputation for its superior management skills and dedication to customer service," said Ho Koon Dow, an executive director of Pico. "We're very fortunate to have them working so closely with us on the Chongqing Convention and Exhibition Centre. We are confident that we have the right team in place to make our facility the new destination for conventions, trade shows, exhibitions and meetings in Central and Western China." 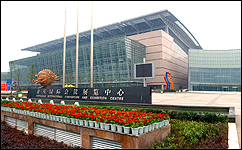 Owned by Chongqing City Construction Investment Corporation, the CQCEC is one of the city's key infrastructure landmarks, an ideal venue for international, regional and national conventions, exhibitions, corporate events and cultural activities. Since its soft-opening on October 12, 2005, the facility has already hosted the high-profiled Fifth Asia Pacific Cities Summit, the 54th China Pharmacy Fair, Western China Finance Forum, Wal-mart Chongqing Launch Ceremony, Met-Life Insurance Conference, British Consulate-General's China-UK Headteacher Forum, the Real Estate Fair, the fifth China Chongqing City Construction and Industry Fair, and the Chongqing International Electric Machine Expo. Major events secured for 2006 include the China National Motor-Cycle Expo, China Beauty and Hair-Care Products Buyers' Fair, China Chain Store Fair, Hong Kong Real Estate Services and City Development Expo and Chongqing Motor Show.